Other names that were floated in general discussion that could be invited to become members of the regional games were Christmas Island, Bougainville, Easter Islands and Hawaii, apart from Australia and New Zealand. 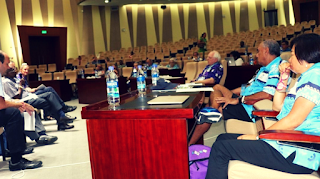 The PGC’s Forum, held after its annual general meeting in Port Vila, Vanuatu, was to hear members on several key topics such as associate membership, bid process and management structure. Countries such as West Papua could in future become associate members with certain voting rights while Bougainville and Christmas Island can send their own sports contingent to the games. A couple of countries were a bit wary of Australia and New Zealand becoming full members, as they could dominate the Pacific Games. Australian Olympic Committee member Helen Brownlee said Australia was sensitive to the sentiments of the islands and would only enter sports where the islands were strong in, such as weightlifting and rugby 7s. The PGC Forum, of which PNG’s Ryan Pini and Tamzin Wardlee are members, also discussed its bid process and management structure regarding terms of office bearers. Members were satisfied with the current arrangement of seven years for bid process and terms of officials in office.